OPS2 monitors the oil pressure differential in reciprocating compressors protecting the compressor against damage if the oil pressure differential falls too low. Internal channels drilled through the housing link the switch to the inlet and outlet ports of the oil pump. The brass mechanical sensor component which is standard on the compressors with an oil pump os directly screwed into the pump housing of the compressor. The black electronic switch can be screwed onto the brass mechanical sensor. If the electronic switch is to be removed from the brass sensor the refrigeration circuit will not be open to the atmosphere. The electronic switches are not interchangeable without making changes to the wiring/circuit. 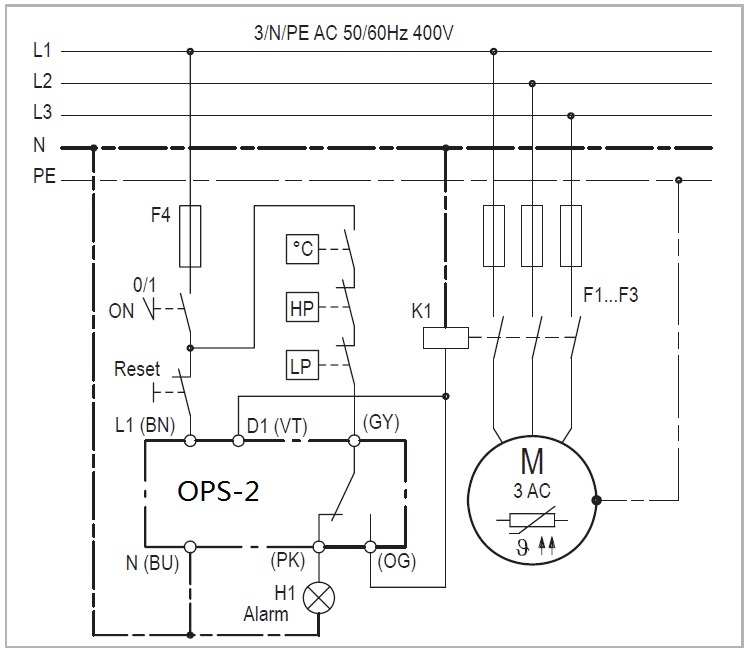 The running signal of the compressor contactor activates the OPS2. If the oil pressure differential drops below the preset value for longer than the time delay(120S) the output contact of the OPS2 opens and protects the compressor against internal damage. Also shorter periods of insufficient oil pressure are recognized. The compressor is also shut off after a appropriate extended tyme delay.